A food allergy is a reaction to food that involves the body’s immune system. It is usually always a protein particle in the food that is responsible for reactions. Your pet may itch, lick, and chew their paws, flank, groin, neck, face, and ears. The itching can be during all seasons. A small percentage of food allergic dogs may only have chronic ear problems. Food allergic pets may also have some gastrointestinal signs such as chronic vomiting, diarrhoea, belching, and frequent bowel movements. Food allergies can develop at any age. The only way to determine whether a pet has a food allergy is to do a food allergy trial. Allergy blood tests and skin tests are not effective in identifying food allergies unfortunately. Although it can seem difficult to do a food trial, if a food allergy is identified at the end of the trial, then a change in diet can make a huge different to the comfort of your pet, and reduce the need for medication to control the problem. Prior to starting a food trial, it is important to provide a thorough history of what foods and treats your pet has eaten. This includes table scraps and chew toys with food flavourings. It is important to note that food allergies develop in response to proteins that have been fed for some time, and they may have been fed for years prior to signs developing. It is highly unlikely to be something new in your pet’s diet that causes the reaction. What Diets are Currently Available for a Food Allergy Trial? 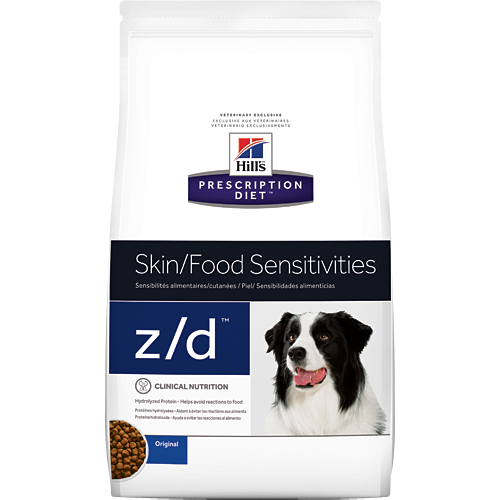 1)Hydrolysed protein diet – Prescription diets - Hill's Prescription Diet z/d ultra or Royal Canin Hypoallergenic. Royal Canin Anallergenic for dogs. The proteins used in these diets have been altered so that they are much smaller in size, and are unlikely to cause a reaction. They have the benefit of being a complete, balanced, ready-made diet. The protein source and carbohydrate source never change in these food allergy diets. These diets are only available through veterinarians. They are formulated to treat a medical condition, in this case, food allergies. For puppies and kittens (under 12 months of age), Royal Canin Hypoallergenic is recommended as it provides a complete diet for growing animals. Royal Canin Anallergenic diet is made from the protein in feathers, of all the diets available it is the least likely to cause a reaction, and so if recommended as the best option for adult dogs if possible. This diet is made from Duck and Tapioca. It would be unusual for a pet in Australia to have been fed Duck or Tapioca, so this may be a suitable diet for a food trial. Pets that won’t eat one of the hydrolysed protein diets may find this diet more palatable. If your pet will not eat one of the above diets, or has a concurrent medical issue that prevents the use of these diets, then a home-made diet may need to be used. Home-made diets usually contain a novel protein source (for your pet, ie. something they have never eaten before) and a carbohydrate. This type of diet is not suitable to be fed long term. It can however be fed for the length of a proper food trial without any concerns. It is not formulated to be a long term complete and balanced diet for your dog because it is deficient in necessary nutrients. To perform a successful food trial, it is essential that your pet is fed only the prescribed diet for the required period of time. The prescribed food must be fed for a minimum of 6 weeks, if your pet is still showing signs of a problem after 6 weeks, the trial may need to be continuing for up to 12 weeks. There are many pitfalls that can occur during a food allergy trial. These pitfalls must be avoided or the food allergy trial will be inconclusive. You and your veterinarian will be unable to determine whether your pet does indeed have food allergies. 1. Feeding your dog any type of snack or chew toy with food flavouring can affect the length and success of the food trial. This mistake may not be just the owner, but can include visitors, relatives, delivery men and children. Use pieces of the prescription dry kibble (if a dry diet is used for the food trial) or prescription tinned food in a Kong toy to provide snacks, entertainment and chewing. If a canned diet is fed, take slices of the canned diet and bake them into dry snacks. Inform visitors that your dog is on a strict diet and cannot be given any other foods except the diet that has been prescribed. Give visitors prescribed kibble or your baked can treats to feed. Family members must understand the food allergy trial and realise the importance of absolutely no snacks. If senior relatives are home with the dog, send the dog to play groups or take the dog to work if possible. Give the relative only acceptable treats. Again, relatives must be a part of the effort to complete the food allergy trial. 2. In a multiple pet house you must prevent the patient from eating the other dog’s food. If there is a cat in the household, eating the cat food will disrupt the food trial. Stand over the dogs or separate the dogs or cats when they are fed. Feed the other animals a very palatable diet that they will eat immediately. This may limit left over food for the patient to get into. Still, remember the faeces will need to be picked up immediately. Even a small lick of an inappropriate food can potentially be a pitfall in a food allergy trial. If possible, put all the dogs/cats on the new diet. Put the cat food up out of the dog’s reach. Place the cat food in a room with a small enough entrance that only the cat can gain access to the food. Avoid or stop free feeding all pets in the household so inappropriate food access in controlled. 3. The pet is given flavoured medication such as chewable heartworm tablets, flavoured antibiotics or anti-inflammatories. The pet may also be given a flavoured vitamin mineral supplement, joint supplement or coat supplement. Flavoured heartworm, worming, and flea preventatives should be replaced by a non-flavoured tablet, topical treatment, or annual injection (for heartworm). Be sure to ask your veterinarian before giving any supplements or medications during a food allergy trial. If your pet is treated at another clinic during an emergency where the veterinarian is not familiar with your pet’s history, be sure to let them know the dog is currently on a strict food allergy trial. Inform them what diet the pet is eating. 4. The dog is not confined and wanders. This patient will be able to get into the garbage, compost piles or the neighbour may feed him treats. Be sure your own rubbish is not within the dog’s reach. Cats eating occasional wildlife, while not ideal, is unlikely to affect the food trial too much. 6. You do not want to continue with the feeding trial because you do not see any improvement in your pet’s condition. Schedule an examination with your veterinarian to discuss your concerns. Your veterinarian has recorded the initial signs and reasons for starting the food trial. Your veterinarian may note and document improvements in your pet. These improvements may be slower than you would prefer or expected. Your veterinarian can give you more information and the encouragement you need to complete the food trial. Medications may be needed to keep your pet comfortable during the trial. Depending on the medications used, your pet is likely to need to stop them for a certain period of time before performing the challenge - speak to your vet about how long this should be. Take photographs of your pet before you start the feeding trial and then biweekly to monitor your pet’s progress. You can also keep a diary if the pet has had gastrointestinal reactions to food. You must be aware that a complete food trial takes at least 6 weeks, and occasionally up to 12 weeks so your patience and persistence are needed. 7. You read or were told by a friend that there is a blood test for food allergies in dogs. Currently these tests are not accurate and are not reliable. They cannot be used to select an appropriate diet for your dog. A food allergy trial is the only way to determine if your dog has food allergies. A positive food allergy trial can improve your dog’s itching and/or gastrointestinal signs. This means that your veterinarian now has a way to treat and manage your dog with an appropriate diet and treats. After the trial you will have the option of continuing the prescription diet, or conducting a food challenge test to work out what specifically your pet is allergic to. If a home-made diet has been used in the food trial, and you and your veterinarian would like to continue that feeding plan, the diet must be balanced, and consultation with a veterinary nutritionist may be required. If you elect to try and find an “over the counter” dog food rather than the prescription or homemade food trial diet, you and your veterinarian can conduct a food challenge test. A new ingredient is added to the successful diet and the dog’s response is followed. If a dog is allergic to that ingredient it will usually react within a few days. If there is no return of the original skin or gastrointestinal signs within 2 weeks, the dog is not allergic to that ingredient. After testing several new ingredients, your veterinarian or a veterinary nutritionist can select a commercial diet you can safely feed your dog. Food allergy trials are the only available means to determine if your dog has food allergies. The trial can be long and difficult, but is worthwhile. If a food allergy trial works, then the long-term treatment for the health of your pet is an appropriate diet.